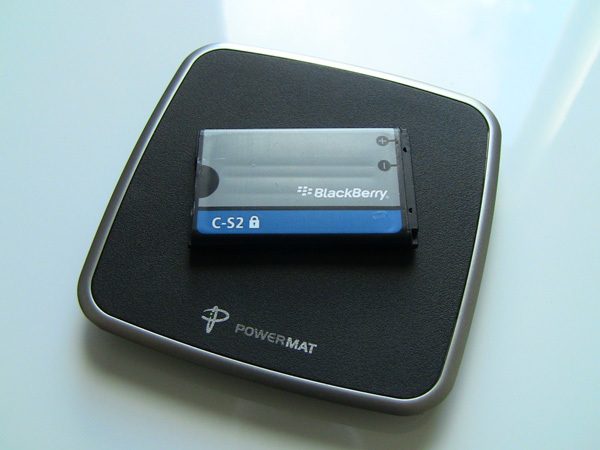 One lucky reader will win a PowerMat Charging System for the BlackBerry Curve 3G! Read on for details. Despite that we live in 2011, battery technology has - for the most part - seen only marginal advancement, leaving us gadget-hungry and digitally-dependent mobile users with little choice when it comes to long lasting battery life. But a conscious decision does not guarantee anything: I sometimes get laughed at for my decision to use a BlackBerry Curve over something like an HTC Desire or Apple iPhone. Yes, they do have Angry Birds (for now), but when it comes to battery life, they all become silent - nothing beats good ol' BlackBerry. That's not to say that the BlackBerry never needs to be charged. But when it's time to plug in, it would be nice to have a more convenient way to charge my BlackBerry - whenever that may be. Sure you could choose a car charger or a charging pod, but what if you want to recharge without wires? Having previously used the BlackBerry Bold 9650, my absolute favorite accessory just has to be the BlackBerry Charging Pod. I am a little budget-conscious, however, and I simply prefer the Curve keyboard over the connected keys found in the Bold series, so I "upgraded" to the BlackBerry Curve 9300 recently. It is, after all, just like any other BlackBerry smartphone at its core. But here is the catch: I can not use it with the BlackBerry Charging Pod. Before, I just dropped the Bold into the Pod and let it charge. The Curve lacks the charging contacts required, so I needed another solution. I searched and researched until I found one: the Powermat Wireless Charging System. Powermat describes itself as a "response to the explosion of electronic devices flooding today's market and the growing need to provide a simple, smart, efficient and clutter-free approach for simultaneously powering multiple devices." Its wireless charging system is simple, not overly expensive (the complete system can be had for less than $60 USD at ShopCrackBerry.com) and seems like a viable option. But, does it work? 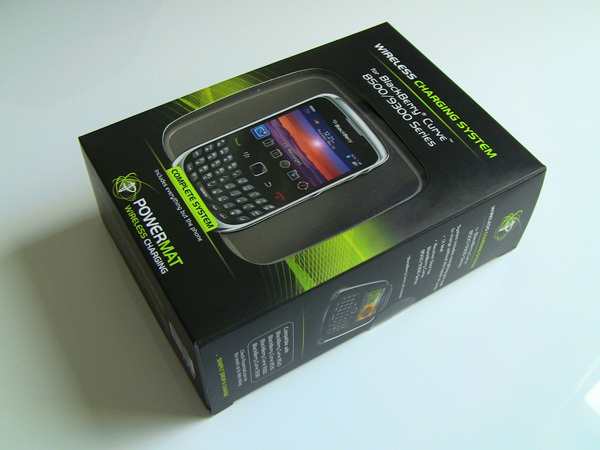 Inside the box you have the Powermat Charging Mat, Receiver Door for your BlackBerry Curve and finally the power supply. Installation is as simple as popping off the battery door of your BlackBerry smartphone, install the Powermat Receiver Door, connect the Charging Mat to a power socket with the supplied power adapter and finally place your BlackBerry on the Charging Mat itself for convenient, wireless charging. The video above takes you through the contents of the box and briefly explains the steps to get you going. With a system this simple, you would not think of any issues - large or minor - to come your way, but I would like to stress a couple of things that I encountered and deemed noteworthy. First and foremost, the Powermat Charging Mat connects to the power supply using a small DC connector. I found out that the connector is similar to the older type of DC connector used in Nokia phones, but the power supply itself has an 18V output at 834mA, which appears to be a one-of-a-kind. Just keep this in mind if you lose the supplied power adapter - only Powermat carries them. Second, I found it a little difficult to use the Powermat Charging Mat, as the magnetic connection sometimes allowed my BlackBerry smartphone to take a position where it was not lined up correctly, thus not charging. This was a minor issue though and could have been an error on my part as well. 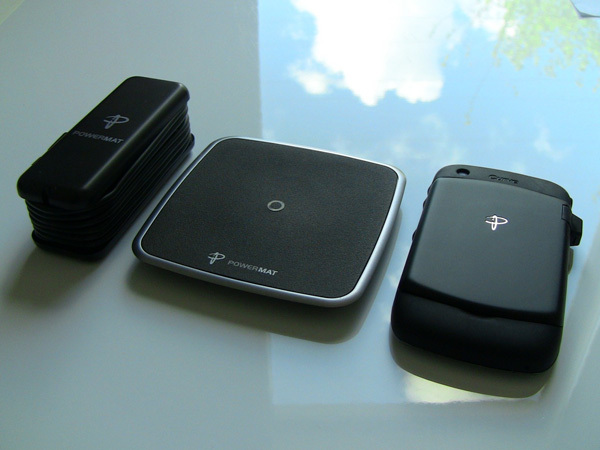 Let me summarize everything in a few sentences: Powermat has proven that its product delivers. Setting everything up is as easy as the alphabet. For the budget-conscious, this may not be the product you are looking for, but if you want to take your BlackBerry Curve to the next level, it might just be. Contest: Want to get one of these for free from ShopCrackBerry.com? Just leave a comment to this review and tell us about a time you forgot to charge your battery. Contest ends this Sunday at midnight PST. Please only leave a single comment. One lucky winner will get this PowerMat charger shipped directly from ShopCrackBerry.com.